Description: CSX U339 heads into Kingsport starting the parade of trains operating after the Santa Train. Description: The Prenter shifter is slowly making its way up the Big Coal Subdivision. 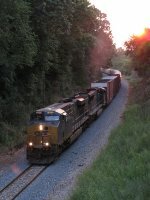 Description: A soutbound CSX coal train runs over the SOU on trackage rights down to Frisco, TN. Description: Southbound CSX coal loads on the SOU at Weber City, VA. Description: Three GEVOs, elephant style leading a empty hopper train out the tunnel. Description: Coal Drag came off the CN/IC. Description: Leading an empty coal train, possibly on its way to get stored at River Junction for the July recess in West Virginia mines. power came back light to Jacksonville. Description: CSX 860 hustles thru the snow heading for the coalfields. Description: rerouted intermodel runs westbound on track two as she hustles past a stopped coal train behind me. Two more were in the hole waiting for her westbound. This is the first time I caught the intermodel on the C&O since it started running it. Description: Throttling up for a power move. Love the sound of those GE prime movers. Description: A few seconds later, they would unleash their inner ALCO's and start smoking. Gotta love GE's. Description: It's 2:30 PM as westbound csx 860 and train start in on number 1 track at Rossville interlocking, Philadelphia Subdivision. Description: U827 idles at Weverton awaiting a crew. Description: CSX 439 & 860 lead an eastbound ethanol train on the IC&E at Genoa, IL.